Payment for orders can be done by offline or online modes, according to suitability of clients. We will make sure any method agreed on by you and the company will be safe and secure. We have a dedicated staff that ensures the quality of material used for designing and production. The inspection is done on the initial stages to make the final product free from defect. Ductile Iron Pipes: We are distinguished supplier of a wide range of optimum quality DI Pipes, which is widely used for transportation of water and sewage. Procured form the trusted and certified vendors, these products are highly appreciated for their high durability, superior strength, resistance to corrosion and accurate dimension. We bring forth an exclusive range of Ductile Iron Pipes for our respected clients spread across the globe. The offered ductile pipe is well-known for its durability, dimensional accuracy and longer service life features. Generally used for the transportation of water & sewage, this is also known for its threading and bending ability. We provide this collection to our clients in customized forms as per their specified details. Introduction Of Ductile Iron: Ductile iron pipe is a pipe made of ductile iron commonly used for potable water transmission and distribution. 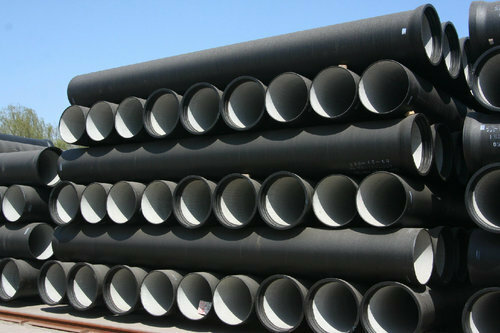 This type of pipe is a direct development of earlier cast iron pipe, which it has superseded. The ductile iron used to manufacture the pipe is characterized by the spheroidal or nodular nature of the graphite within the iron. Typically, the pipe is manufactured using centrifugal casting in metal or resin lined moulds. Protective internal linings and external coatings are often applied to ductile iron pipes to inhibit corrosion : the standard internal lining is cement mortar and standard external coatings include bonded zinc, asphalt or water-based paint. In highly corrosive environments loose polyethylene sleeving (LPS) to encase the pipe may also be used.